I read an article the other day from Sedruola Maruska of Yarn Obsession. She wrote the article earlier this year and evidently someone recently had issue with it. She posted on her Facebook page that she again researched her findings and stood by her article. Sedie was talking about a hot topic in the crochet world where people release their patterns (free or paid) and then decide to tell others they can’t sell items made from their patterns. Here is the entire article if you care to read about it. I’ve been thinking about what Sedie had to say and want to express my own personal views. I agree with Sedie’s article completely. How could anyone “police” whether someone is selling items made from their patterns? Why would you want to? I couldn’t imagine the amount of energy it would take to try to manage something of that magnitude. It’s just plain silly to me. Most of the people in crochet are women with some exceptions like The Crochet Dude or Mikey from The Creative Crochet Crowd. We, as women, should build each other up instead of tearing down. I’m not a stay at home mom but know that many of the business pages that I follow are stay at home moms just trying to earn a little extra money for their families. Why wouldn’t we want to help them grow? I have free and paid for patterns and don’t give a hoot who sells their projects from them. I encourage people to sell their items from my patterns. I consider it a compliment if someone takes the time to come to my blog, ELK Studio’s Facebook page, Etsy, etc, and then decide they feel like my pattern is worthy of their time and talents. Take Elena from BeatriceRyanDesigns, she made my free Hounds Tooth Beanie hat and gave it her own twist. I doubt she would have even bothered to give me the time of day had I specified that you couldn’t sell items made from my patterns. (By the way, I don’t have a legal right to do that anyway). But since I don’t have any disclosures refraining people, I’m sure it helped her in the decision process. The only requests I have is that you let people know that I (ELK Studio) created the design and not to use my pictures as your own. I think it’s a given not to use my pictures and why would you want to portray my work as your own? The credit given to me for my pattern is common courtesy and respect. Maybe it was my raising, but for me it’s an ethical issue. I wouldn’t want to take credit for something I didn’t do. Let’s go back to Eleana for a second. She made the hat, gave me credit for the design and posted a blog about her results. She also shared a picture on my Facebook page which I in turn shared for everyone to see. As the designer, it behooves me to encourage people to make projects from my pattern. Why? Well, with her post I had more views than I could have imagined. It ranks up there with the debut of my Southern line of hats and more “likes” for a post than normal. She did part of the work and so did I, and we were both able to reap the reward. It’s a win-win situation for both of us. I also wrote about her hat on my blog and we have exchanged an increase in views together, again both of us win. We as women need to rise up and help one another to reach our full potential. It’s our calling from God to help our fellow sisters. So what if a person has more success than you do? Be proud of her, watch her, learn from her and who knows what will happen. Maybe she will take you under her wing and share some of her experiences to help you get there too. It’s a much deeper issue for me when I see people not willing (for whatever reason and I’m sure they think it’s a good one) to allow others to succeed. Frankly, why are you putting your patterns out there if you don’t want anyone to make (sell) them? I may have touched on a hot button and respect a different viewpoint. Should you decide to express it, please use common sense language and leave ugly words out. I want to share what everyone has to say but please be respectful. Some of the women at our church met today at the Overall Company, which is a local coffee shop. The atmosphere of the shop is so warm and inviting not to mention the chocolate latte and bacon biscuit I had today! Anyway, we are planning an event and decided on a garden theme. Ideas were everywhere! I’m not the kind of person that can think of these great ideas so quickly like other people. I like to have the meeting and then have time to digest all the information and then start focusing on what I would like to do. As I was driving home, I kept thinking of an outdoor garden and how could I create some inexpensive projects as part of the decorations. I came home and went into my craft room and remembered that I had bought some jute a few months back. I sat down on my sofa and started to think about what I could do with it. 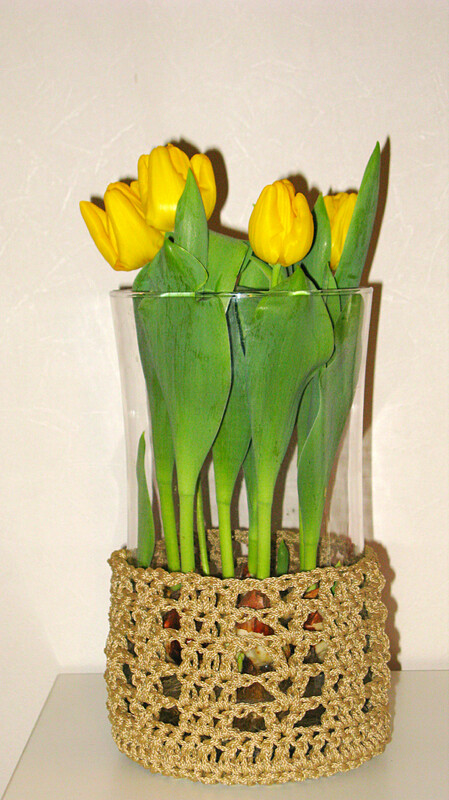 A really good friend of mine gave me a beautiful vase with tulips today, so I decided to make a flower-pot holder for the vase. 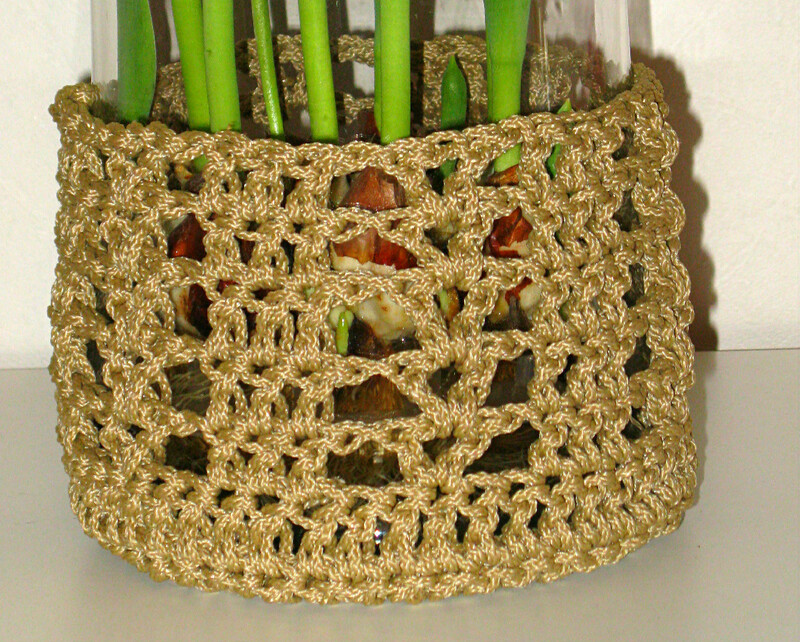 I love the jute (although it doesn’t love my hands) and how it turned out. I’m thinking now maybe I will make a hanging basket! Any other suggestions for a garden theme? I would love to hear them. The event is in March so that doesn’t give me much time, so send any quick projects my way! God Bless and Happy Crocheting! Do You Dream of More? The moment when you finished the last stitch and the project is complete! Well, there isn’t much more exciting for me than to have a finished product sitting in my hands. 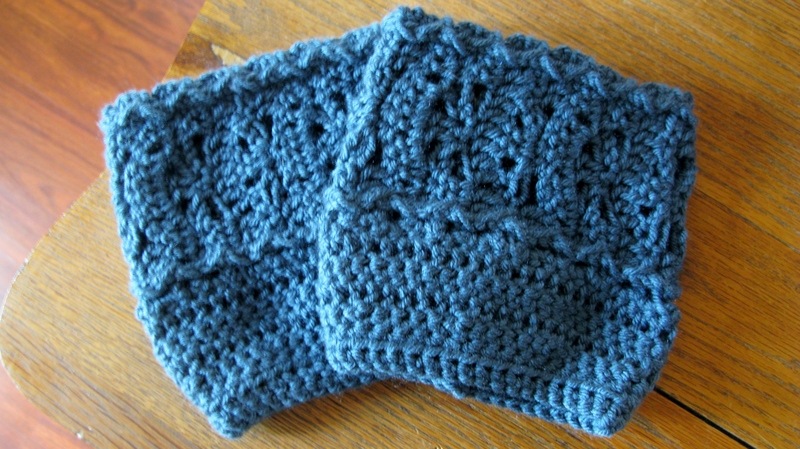 I just finished 5 pair of boot cuffs for a customer today and feel pretty pumped! Although I have crocheted for years, up until recently I have only made things for my family. Never have I “sold” anything to anyone. It’s so much fun when you get a picture of your customer wearing your product! I post all of them of my Facebook page proudly! There is so much work and truly even more love that goes into every stitch to make that hat, scarf or boot cuff look perfect and to see your work in a picture along with someone smiling, well it’s all worth it. It truly is an honor and mostly a pleasure to sit down and write out a pattern to share with others or to make those cuffs for a woman so that she feels beautiful. I believe we are all talented in some way and that crochet is just a way for me to let out my creative side and to sooth my soul on those trying days when life gets hard. What does crochet do for you? Is it just a hobby or do you dream of owning your own business? Share your story.